Security is what the borrower puts up to guarantee payment of the loan. Moreover security means immovable & chattel or personal asset or assets to which a lender can have recourse if the borrower defaults in the loan payment. There are two types of banks security. If any banks client himself or third party is considered as security is called personal security. without receiving the immovable & chattel assets as security, if bank can receive any client himself or any person own self on be half of that client as security is considered as personal security. Bank will consider the person or third party only for then when he has enough social dignity and goodwill or a scope of applying law against himself in future or he is engaged in renowned business, government or recognized non government organization. 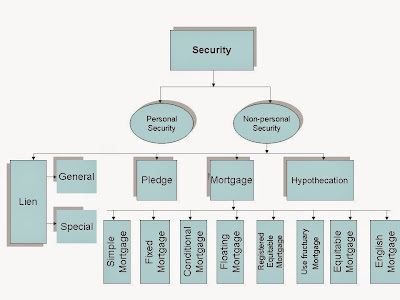 The above four categories of non-personal security are given below with detail. The right of retain foods is known as lien. The lawful right of a lender to offer the guarantee property of an account holder who neglects to meet the commitments of an advance contract. A lien exists, for instance, when an individual takes out a vehicles advance. The lien holder is the bank that allows the advance, and the lien is discharged when the credit is forked over the required funds. Another kind of lien is a repairman's lien, which can be appended to genuine property if the property proprietor neglects to pay a foreman for administrations rendered. In the event that the account holder never pays, the property can be sold to pay the lien holder. there are two types of lien. Here, Bank has the possess of the assets have been kept as security and bank can't transfer the possession to another until the loan amount is being paid. Here, Bank has the possess of the assets have been kept as security and bank can transfer the possession to another on conditions is called special lien. Here the possess of assets is to bank or loan provider, but the ownership is to borrower. After payment, bank transfers the possession of security assets to borrower. When a customer takes loan against jewels he pledges the jewel to the bank. Similarly a customer availing loan on key cash credit basis pledges the goods to the banker by keeping them in a godown under lock and key control of the bank. Pledged goods are to be insured and the pledgee (banker) has to take reasonable care to protect the property pledged. It is an interest in property created as security for a loan or payment of debt and terminated on payment of the loan or debt. A mortgage is a contract that permits a loan provider partially or fully to foreclose that security when a borrower is unable to pay the loan amount. Mortgage is applicable only for immovable assets and this is why it is called immovable property mortgage. There are many types of mortgage have been described below. If the loan amount isn't paid by borrower and legal step is taken against him or lender can purchase which security assets on the opinion of borrower is called simple mortgage. The borrower gives which property in black & white or in registering to the lender and if the loan is not paid in time, then legal possession of that security is gained by lender is called fixed mortgage. If the loan amount isn't paid in time and without fulfilling the determined conditions, the which security is not sold or transfered is called conditional mortgage. The possession right of which mortgage properly is belonged to borrower and only documents are submitted to loan provider is called floating mortgage. The documents of which mortgage property is kept to bank for a specific time period and possession is belonged to borrower and after exceeding the payment period bank try to gain the legal possession is called equitable mortgage. The ownership documents of which mortgage property is kept to lone provider with registration for a specific time period and possession is belonged to borrower is called registered equitable mortgage. The possession & consumption of which mortgage property is given to loan provider as loan providing till a specific time period and after exceeding that time period the belongingness of that property is leaved to borrower is called use fructuary mortgage. The ownership of which mortgage property is to loan provider and possession or belongingness of that property is to borrower is called English mortgage. If borrower is fail to pay the loan amount then the possession power is automatically gone to loan provider. It is pledge to secure an obligation without delivery of title or possession. At last we can say that, at the modern banking sectors a great changes has been occurred in the categories of categories of mortgage.